In this customizable racing game, your Hot Rod Creeps team is your ticket to glory! Each team has its own special deck of movement cards and its own strategy. Customize your Hot Rod! Add a new Engine, Weapon, Pit Crew, or set of Wheels at a Pit Stop along the way. Customize your racetracks! Make them as wild and crazy as you want, with more than 50 interlocking track tiles. 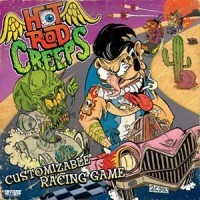 Everything you need for a race unlike anything you’ve ever see is included with Hot Rod Creeps! There are six teams to choose from: Epic Battle Wizards, Monsters, The Underworld, Food Fighters, Aliens and Rockabilly! Build your own track! Dangerous Curves, Pit Stops, “The Jump”, and Hazards are but a few of the dozens of track pieces that allow you to create the track of your dreams… or nightmares! Each Hot Rod has its own deck and its own unique strategy. Your deck doubles as your Gas Tank. Run out of cards and you run out of gas! Players also have access to the powerful, but often dangerous, Nitro deck. Blaze a trail to the front of the pack, but watch out – you might get burned! Customize your Hot Rod with cards like the Horrific Hamster Haven, the Black Plague Rat-apult, the Ketchup Mechanics, or the Clown Car Corner Clingers. Blast your opponents as you blow by them. When I first read the description of this game, I was very excited to play Hot Rod Creeps. The notion of building my own track, with the ability to customize my hot rod with weapons, wheels, and engine parts sound incredibly enticing. But after a few playthroughs, I doubt I’ll take this game out of the box again. – Players build a raceway with track pieces that connect end to end like puzzle pieces. – These track pieces are subdivided into spaces, and players take turns moving their hot rods around the track by playing cards from their hand that determine how many spaces they must move. This is known as the car’s speed. – If a car lands on a special Pit Stop space, they have the opportunity to draw and add power ups to their vehicle, which grants it special abilities. – Sharp and gentle turns on the track have a speed rating, and passing through these turns at a higher speed will damage your vehicle, causing you to lose cards from your hand and power ups from your hot rod. And while all of this sounds like it could be a board game version of Mario Kart, I feel the game falls short. I think board games are most interesting when they escalate in some way. Unfortunately, the only way the gameplay changes in Hot Rod Creeps is when players add power ups to their cars. This, however, is done arbitrarily by landing on the right space, meaning the player has to play the right speed card. That’s not always within the players control, and for a game with so many modifiers and gameplay components, the lack of control can be frustrating. There’s a lot of gameplay potential here. Each player gets a unique hot rod and their own set of cards that determine the way the car handles. The power ups applied to the cars are creative and can be combined to change a hot rod’s play style. But sadly, everything is all too random to be any fun in the long run. This game has loads of replay value, only to be marred by a lack of control and strategy. I’d love to see an update of this game with revised mechanics and rules, but as it stands now, I’m not having as much fun and I hoped I’d have. Got an opportunity to demo this game at GenCon and I must say it was a lot of fun. It is one of those games that both doubles as something that you can play with you kids, if you have any, or sit around one night with your friends drinking beers and eating pizza. The rules are fairly simple to grasp and the re-playability on the game is limitless with the ability to constantly change the track. In addition, the game is never the same with the ability to “trick-out” your hot rod with various weapons, tires, engines, etc. The game is good fun for one and all. Add a Review for "Hot Rod Creeps"